– Friday 23 Oct. 7-9am and noon-5pm. – Saturday 24 and Sunday 25 Oct. 7-9am and 4.30-6pm. Insofar as possible, please bring an alb and altar linens. – A car will be available at San Lorenzo in Damaso for the transportation of any personal belongings, and will be parked at the Augustinianum, where items may be collected after the Mass in St Peter’s. – Please wear cassock and surplice. 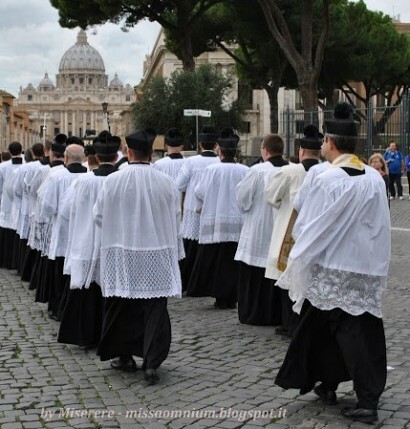 – If you use the biretta, do not wear it in church ; only wear it outside of church. – Please keep your hands joined during the Procession. – Make sure you stay properly in line during the Procession. This entry was posted in #sumpont2015 and tagged private masses. Bookmark the permalink.